A detailed travel guide about Bangalore. Great advices for shopping, things to do, places to visit and the best restaurants in the city can be found. One of the most populous, vivacious and developed cities in India, Bangalore remains as an attraction point in the country. Reputed as the “Silicon Valley of India”, Bangalore plays a vital role as India’s IT exporter. This metropolitan city of India also welcomes many students and international workers especially in the field of Information Technology. Although known as the “Garden City”, Bangalore now has more buildings, less green spaces due to its rising population. Many educational institutions and headquarters of remarkable IT companies are located in Bangalore. The city is also home to Kannada film industry. Most people in Bangalore can speak English compared to other cities in India and the education level is higher. On one side of a street you can notice the skyscrapers but on the other side, you can see the poverty. However, the city keeps growing so fast that this gap is getting smaller. Bangalore is a vibrant city where people will greet you with a warm welcome and where you will experience a distinct and interesting culture as well as an unforgettable Indian cuisine. If you are ready to discover this different face of India, come and take a ride with us in Bangalore! The capital city of Karnataka state, Bangalore is located towards the south edge of India and south east of the state of Karnataka. How to Get to Bangalore? Kempegowda International Airport is located about 30 km away from the city center. On the official website of Kempegowda International Airport, you can find more detailed information about the airport and the transportation options. Located in Cubbon Park, Visvesvaraya Industrial and Technological Museum that was opened in 1962 by Pandit Jawaharlal Nehru, the first Prime Minister of India has a large collection of industrial products and engines. If you are interested in science, this museum will much appeal to you. If art is your field of interest, National Gallery of Modern Art will meet your expectations. Its collection is the largest contemporary art collection in India. The museum is located in Palace Road and welcomes its visitors in a calm and beautiful neighborhood. Cubbon Park is a place in Bangalore that you will get enough of green and the other nature colors. It is located in the center of the city and you will also have the chance to see the impressive Gothic-style State Central Library, Vidhana Soudha that is seat of the state legislature of Karnataka and the neoclassical red brick building, Attara Kacheri. 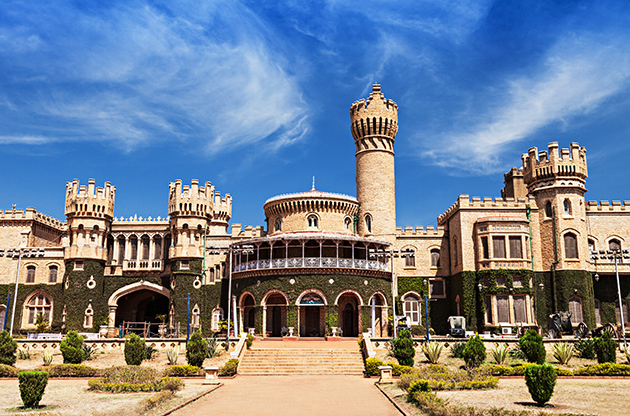 Located in Karnataka, Bangalore Palace is one of the most significant buildings in Bangalore. Bangalore Palace is built in Tudor style architecture in 1944. The interiors of the palace are also impressively decorated with ceiling paintings, wood carvings and elegant floral motifs. Known as one of the biggest largest ISKCON temples in the world, ISKCON Temple Bangalore (Sri Radha Krishna Temple) is located on Hare Krishna Hill in Rajajinagar. The temple has six shrines and houses many festivals during the year. ISKCON Temple is definitely among the places that you should never miss paying a visit to. Lal Bagh Botanical Garden is a place where you can take a break from the rush in the city. It is located in southern part of the city and known as to have a most diverse plants in the world. In this garden, there are also an aquarium a lake and a glass house where a flower show is held each year. Bannerghatta National Park is a popular tourist attraction being an address for a pet corner, a zoo, as safari park, a butterfly enclosure, an aquarium, and a snake house. In Bannerghatta National Park there are also ancient temples that are open to worship. Tipu Sultan's Summer Palace is built in Indo-Islamic architecture and it is located within the walls of the Bangalore Fort. The whole palace was made of teak and adorned with arches, balconies and pillars. Supported by the state, Cauvery Crafts is one of the most suitable place to pick souvenirs both for yourself and your friends and family. All the items are handmade and you can find many different traditional products that are made of rose wood, sandal wood, bronze or lacquer. Mother Earth produces sustainable products like home textile, accessories, apparel and decoration items. All of them reflect Indian style. Mother Earth has 3 stores in Bangalore. Reputed as the first luxury shopping mall in India, you can enjoy shopping and dining in a high-end atmosphere. It is located in the central business district and houses the many reputable world brands. Krishna Rajendra Market is known as the largest flower market in Asia and it offers Bangalore visitors a perfect opportunity to experience the traditional India. Time Traveller is one of the most popular restaurants in the city both among the locals and the tourists. Its vegetarian cuisine is especially applaudable and the prices are really reasonable for such a great atmosphere and a high-quality dishes. Located in the Gateway Hotel, Karavalli Restaurant is a perfect stop for the ones who are into seafood and the vegetarian cuisine. If Indian cuisine doesn’t appeal to you much, Karavalli will be your harbor. Citrus Restaurant that is located at the Leela Palace Hotel offers a rich menu including the best samples from Indian, Asian and the World cuisine. Offering a tasty Indian cuisine in a fabulous atmosphere, Le Jardin is popular especially for the breakfast menu. It is located in The Oberoi Hotel on Mahatma Gandhi Road. Srirangapatna is a town that is located nearly 140 km away from Bangalore. The historic, cultural and the religious importance of this town makes it popular especially among the tourists. The must-visit temple in this town is Sri Ranganathaswamy Temple that was built in Dravidian architecture. The “Silicon Valley of India”, Bangalore is a fast growing city and so it is one of the most in demand venue for business and academic events in the world. It is the third most populous city in India and each year many international trade fairs, congresses, conferences and symposiums are held there to draw global attention.